Flat Earth believers have been around since biblical times and even photos of Earth taken from space have not deterred them. Michael N Wilmore, 27, was born in London and moved to Ireland in his teens. He is the vice president of the Flat Earth Society, which he joined in 2006. Wilmore first went into the society as a devil’s advocate, but after about four or five months he was a convert. He said: “I believed in a round Earth theory, I went to school and learnt the same things as everyone else did. I joined and started debating and arguing with some of the other members there and I was surprised to see that often the flat earthers knew more about round Earth theory than me or any of the other round earthers and they had better arguments in many instances.” Wilmore’s description of his conversion due to a lack of knowledge of people having about the Earth seemed very inconclusive and seemed more about just enjoying a learning process. The modern Flat Earth Society was formed by Englishman Samuel Shenton in 1956. It was led later by Charles K. Johnson who had a fire at his house in California in 1995 which destroyed historical Flat Earth Society documents he had collected over the decades. When Johnson died in 2001, the society became inactive with no one being enthusiastic enough to take the initiative. Only in 2004, Daniel Shenton, no connection to Samuel, decided to build up the new society as president and managed to get hold of surviving records. Unexpectedly a lot more of the society’s past comes from a “round earthers” book published in 2007. Dr Garwood said: “There was a conscious effort to write a definitive history based on detailed research. No other book outlines the modern revival of the idea from 1830 through Flat Earth Societies, or ‘Zetetic Societies’ as they called themselves. It’s great that it’s the Flat Earth Society’s main source for learning about their past!” The two worlds connect with a love of the society’s history, but it ends there. 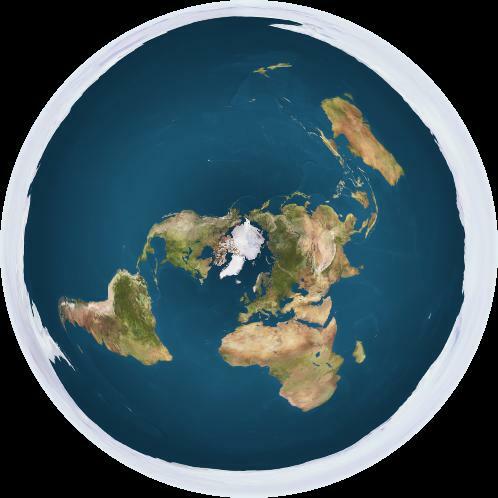 One of the two main theories of the flat Earth is that Earth is a disc of finite width and depth, always accelerating upwards, causing gravity. But Wilmore believes in the second theory “that is more in line with contemporary round Earth Physics.” In this theory, Earth is considered an infinite plane, about 4000 km thick and without a centre of gravity. Dr Garwood will be giving a talk at the Natural History Museum this week, marking the centenary of Alfred Russel Wallace, a pioneer of the theory of evolution by natural selection. She will be discussing the 1870 incident when the Christian polemicist and “flat earther” John Hampden was so sure of his belief that he started a bet offering £500 to anyone who could prove the curvature of the Earth’s surface. It resulted in the measuring of the curvature of a canal in Norfolk and made Hampden £500 poorer. 143 years later, the incident is used to illustrate how progress and advancement in hard scientific facts triumph over blind beliefs. Dr Garwood’s book also looks at the misconception about Columbus being the first person to discover that the world was a globe. She points out that long before the Greeks knew this to be the case from the teachings of Pythagoras to Aristotle and Ptolemy. When asked, Wilmore could not explain what is underneath the disk that is Earth in his view. He explained that we would not fall off because the world is infinite, without an edge. He also believes that images taken from space, showing the Earth as a globe, are faked in his mind, created to deceive us. Wilmore and other Flat Earth Society members have conducted so-called experiments to prove their theory. Like Hampden trying to measure the curvature of a canal in his day, such experiments mainly involve large bodies of standing water to prove that the Earth’s surface is not convex. Other “experiments” just involve a plumb line and a stick, and they are all concerned with proving the “round earther” wrong. BTW they do have a London branch see in link. Hope this helps and thanks for reading Synchronicity. How wide is the flat Earth? I want to drive to the edge and look down. What does the underside look like? London Short Film Festival 2015: cats, cool, clever, creepy and some…just plain crap!